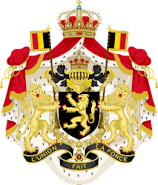 Dedicated to the monarchs of Belgium, and other topics of historical, cultural, human, political, and religious interest. The fact that a link is provided on this blog does not necessarily imply endorsement of everything at the other end of the link. A war correspondent's report on the courage and steadfastness of the Belgian people during the second German assault on their country in a generation. Although the King and his government were soon to suffer a fatal rift, it is undoubtedly true that all parties showed bravery in the common struggle against the invader. We should like to describe the most reckless and the most abject of the exploits of the parachutists, but we doubt whether the censor will allow it. The brave King Leopold III had joined his Army on the morning of the Friday. Nazi espionage, it seems, had discovered the position from which he was to direct operations. It was a fort on the outskirts of Liege. A long succession of parachutists descended from the clouds and attempted to seize the Sovereign. The bravery of the Belgian soldiers made their efforts vain, but the fort in question was attacked unceasingly until finally, after the King had gone to another part of the front line, it was captured. The attitude of the young King, together with the legendary heroism of the Belgian soldiers and the calm energy of the Government, maintained the morale of the population. The wireless had at first announced that the King would speak to his people, but his message was in fact published in the newspapers, for the King was unwilling to lose a single minute that he could devote to his duties as Commander-in-Chief of his armies. This little story, quickly spread among the people, made a great impression. The calm dignity of the session of the two Chambers happily supported the example given by the King. And the Ministers were not less deserving of admiration. The dramatic interview between M. Spaak and the German Ambassador will long be remembered. The "moi d'abord" with which M. Spaak compelled his visitor to listen to a reply anticipating the humiliating proposals which he brought, was more spectacular in its proud defiance, but it was not finer than the courage of M. Pierlot. I met the Prime Minister on the morning of Saturday, the 11th, as he was walking quite alone, his despatch case in his hand, on his way on foot from his modest home to the Government buildings in the Rue de la Loi. Was this to show to all that Belgium had nothing to fear from a Fifth Column ? And his speeches, in which each evening he brought consolation to his countrymen, were courageous, resolute but never unwarrantably optimistic. And the people themselves, so good, so honest, so loyal, so valiant and so undeservedly embroiled in a fearful slaughter. To them all honour is due. Never was such a rude awakening suffered with such serenity. Nothing but the necessities of the Army was allowed to interfere in any degree with the normal tempo of life. Men continued quietly in their occupations. The flower-sellers, the newspaper sellers in Brussels never left their pitches during air-raid alarms. The newspapers carried their long lists of small advertisements, a thousand petty transactions which proceeded as if nothing had happened. The shops where food was sold, wonderfully stocked, were undisturbed by pillagers or by hoarders. Slowly, almost cheerfully, people set to work to make their arrangements for a black-out, and to protect their windows from the flying fragments of bombs. No panic, no despair. But an anger which will never more forgive this second attack on an innocent country. These Belgians do not harbour any illusions. They know that they must pass through the ordeal of a second occupation by the enemy. But they are none the less convinced of the final victory of the Allies and of a glorious future for their country. The solution of the problems which oppress the world can only be found in the practice of Charity between individuals and between nations. What is the Cross of Laeken?